It's called "the cornfield" because crops grew there in the 19th century. More recently, this 32-acre property on the edge of LA's downtown and Chinatown was an abandoned railyard slated for a one-million-square-foot industrial development. But many residents thought the land should become a state park--and with good reason. Local children play on blacktop school yards, and there are no public ball fields nearby. 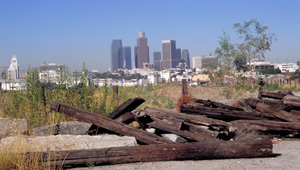 We stepped in, negotiated with the developer, purchased the land in late 2001 using an appropriation from the California Legislature, and managed cleanup of the site. Served by a new transit station, the park will be accessible to millions of low-income families.